As an Office 365 Admin, you are bound to secure all your Office 365 users. A robust method to do that is by deploying Multi-factor Authentication (MFA) which protects you even when your password gets stolen. Once you have decided to deploy MFA, there are two main challenges you face – Enabling MFA for right users, and Periodic auditing of user’s MFA settings. Many organizations have their own rule to decide who needs MFA and who don’t. Let’s see a few rules some organizations follow. Don’t enable MFA if the user is used in legacy services. In any organization, users are created from different places like HR software, Admin automated scripts, and so on. You have to periodically audit whether the settings are applied to the new users as expected by your organization. The Office 365 or Microsoft 365 portal only allows you to filter users on their MFA status and not based on several other criteria kept forward by your Org. Sadly, you have to depend on Microsoft Graph, Office 365 APIs and many other MSOnline PowerShell command-lets like Get-MsolUser to script your way through it. Keyboards down guys. You don’t have to start typing your complex PowerShell scripts as soon as I mention it! We have a better solution! Office 365 MFA reports – made easy with AdminDroid! AdminDroid Office 365 Reporter has introduced a variety of MFA reports which helps you to identify the users’ MFA status, authentication methods, authentication details used for additional verification, and all required properties of users to help you with your MFA requirements and improve security. Let me give you a walkthrough on how to leverage the new MFA reports to get what you need from Office 365 with AdminDroid. Find Admin users who don’t have MFA – navigate to Admins without MFA report, and that’s all. You got it. Find users without MFA from the Accounts department – navigate to Users without MFA report and filter on the Accounts Department with the help of quick filters on top of the report. Find new users without MFA – navigate to Users without MFA report and set the ‘When Created’ filter on top of the report to ‘Last 7 Days’ or any other range of your choice. Find users who have not configured additional authentication even when MFA is enabled/enforced easily by using MFA Non-activated Users report. Once you are ready with the desired set of users by exporting them in CSV format, you can easily Bulk update the users in MFA. You can also export the reports in XLS, XLSX, PDF, and HTML in addition to CSV. We have also included reports that show the Authentication Methods, Authentication Phone numbers and emails, Authentication devices used. You can also add additional filters like user’s Admin-Roles, Date Created, Licenses assigned, Department, Job Title, and many more to all the reports. Know more about the Advanced Filtering Options available in AdminDroid. Office 365 MFA audit reports – directly to your email! With growing threats word-wide, we have to audit all the O365 activities periodically to maintain a safe and secure atmosphere. Using AdminDroid’s automatic schedulers, you can schedule the MFA reports of your choice and get them to your email or send them directly to your Auditors. The schedulers can also be customized to send in the format of your choice like CSV, PDF, XLS, XLSX and HTML, and custom timings can also be chosen from variety of timing options. 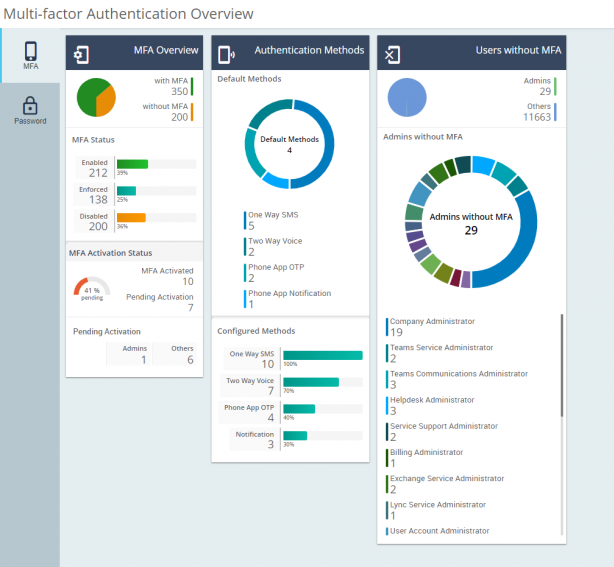 Office 365 MFA Secure Score – an easy way to Audit. AdminDroid enhances your MFA Auditing with three powerful Office 365 Secure score reports. Here are the three key reports that you would need for a complete MFA Audit – all three pre-built into AdminDroid! Each of these reports show your day to day changes in MFA which could be leveraged to find any MFA violations anytime. AdminDroid also offers a whole bunch of over 60+ Office 365 Secure score reports which can also be used to improve your security to the core. Along with all the offerings showcased above, AdminDroid has introduced a dedicated dashboard for MFA which has everything you need to know about your Office 365 wearing the MFA glasses. Download our free trial of the Office 365 Reporter to see all MFA and several other functionalities in action. Deploy MFA and avoid a Mayday!